A 1965 graduate of Danbury High, Ralph DeSantis Jr. was a two-year starter for the football team. He was an offensive and defensive tackle for legendary Coach Copper Crotty, and his senior year played for first year Coach Ed Yedzinak. Ralph was also football captain his senior year and a member of the Hatter’s track team. In 1965 he played for the West Squad in the Nutmeg Bowl. After his graduation from Danbury High School, Ralph continued his football playing career at Southern Connecticut State University, playing offensive guard for Coach Harry Shay. While playing for the Southern Owls, the football team won two Eastern Football Conference Championships. After working at Naugatuck High, Ralph took a teaching and coaching job at Bethel High School. While coaching football at Bethel High, his teams won five Western Connecticut Conference championships and four Briggs Division championships. In 1988 the Bethel football team was the state runner-up in the Class MM division. His overall career record was 149-55-6. Never a one-dimensional teacher, Ralph was class advisor to Bethel High classes of 1978 and 1992. Ralph served as chairman of the Connecticut High School Coaches Association for two years initiating their annual dinner. He served as president of the Fairfield County Chapter of the National Football Foundation in 1988. He reorganized the local chapter and in 1989 scholar/athlete awards were again presented to area youth. Ralph was also active in the Owl Varsity Club at Southern Connecticut State University, serving as president in 1988-89. In recognition of his many accomplishments on and off the football field, Ralph received many honors. He was twice selected WLAD Coach of the Year, Bridgeport Post Coach of the Year in 1987, and Danbury News-Times Coach of the Year in 1989. 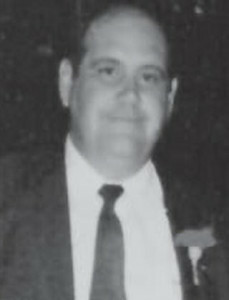 In 1990 the Connecticut High School Coaches Association selected Ralph as Football Coach of the Year. Ralph and his wife, Lorinda, have two children, Jami Lynn and Ralph John DeSantis III. Sadly, Ralph passed in April 1993. After his death he was awarded the Nutmeg Games Legends Award, the Distinguished Service Award from the National Football Foundation and was inducted into the Southern Connecticut Hall of Fame and the Danbury Old Timers Association. In September 1993 the football field at Bethel High School was dedicated and named The Ralph J. DeSantis Jr. Memorial Field. A pillar of Connecticut and national high school athletics for more than 50 years. A member of both the National High School and Connecticut High School Hall of Fame, McDougall’s Trumbull football teams reigned supreme in Connecticut from 1967-1998. 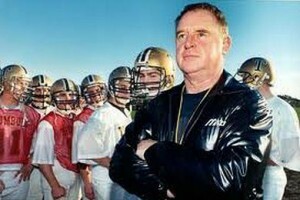 During his tenure, Trumbull won an unprecedented 265 games, three state championships and five FCIAC championships. He coached five undefeated teams and finished No. 1 in the state four times. McDougall retired as the all-time winningest football coach in state history and influenced countless people in Trumbull, Fairfield County and Connecticut. For all of his accomplishments, McDougall amassed a dizzying resume of state and national coaching accolades. He was the Connecticut High School Coaches Association’s football coach of the year in 1976 and baseball coach of the year in 1995. He earned the same honors from the National High School Athletics Federation in 1993 (football) and 2003 (baseball). Our mission is to promote and develop the power of amateur football in developing the qualities of leadership, sportsmanship, competitive zeal and the drive for academic excellence in America’s young people.